Get information on airport services, flight schedules, airlines, and tourist attactions in Turin. Turin can easily be reached by any method and from any place, and it's the ideal base for speedily getting to all the tourist spots of the province in the comfort of vehicles and public transport. Find the name, address and phone numbers for guarded parking areas, taxi companies, car rental companies and scooter rental places. 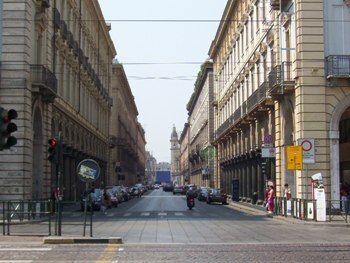 The GTT is Turin's public transportation system, which includes buses and trams. Construction of the Metro begain in 2000. By 2006 it will link several areas of the city between Collegno and Porta Nuova. If you enjoy cycling Turin has a network of bicycle paths located throughout the city.